If you have any gamers on your holiday shopping list this year, there are some fantastic games that have recently come out that we think they’ll really like. LEGO fan? Who isn’t? But when you combine LEGO with video games and then mix in the DC Universe, well, you’ve got the recipe for a sure-fire winner right there. This just-released game lets gamers play as villains for the first time ever. Choose from The Joker, Harley Quinn, Lex Luthor, Deathstroke, Killer Frost, Sinestro, and more from the Legion of Doom, then get down to the serious business of creating chaos and fighting against the forces of good. 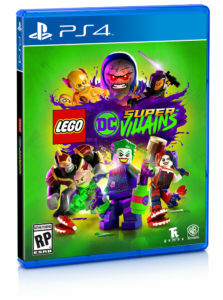 This is an action-adventure game that’s similar to LEGO Batman and features a two-player cooperative multiplayer mode. It’s available for the Nintendo Switch, PlayStation 4, Xbox One, and PC. Prices vary. This fun-filled game features all your favorite characters getting themselves into and out of trouble. Take control of your favorite Incredible and recreate favorite scenes from the movie or create entirely new ones. Just be sure you team up with the rest of the family so you can save the world Incredibles—and LEGO—style. Available for the Nintendo Switch, PlayStation 4, Xbox One, and PC. Prices vary. As big Harry Potter fans, we were really looking forward to this one, and simply can’t get enough of it. LEGO Harry Potter games were the first ones that created a hub to interact between missions or chapters. There are many secrets to discover at Hogwarts and its grounds. You can play as many different characters once you unlock them, and you’ll need to do so in order to progress to different areas. This game will cast its spell on everyone, young and young-at-heart alike. This compilation brings LEGO Harry Potter: Years 1-4 and LEGO Harry Potter: Years 5-7 to the Nintendo Switch and Xbox One with both top-selling videogames remastered into one. Available now for Nintendo Switch, PlayStation 4, Xbox One. Prices vary. 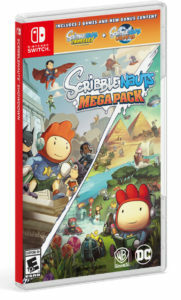 This is a two-game collection that features entire versions of both Scribblenauts Unlimited and Scribblenauts Unmasked: A DC Comics Adventure. You also get special bonus content for both games. Scribblenauts Unlimited follows the storyline of trying to save your sister, who’s trapped. You have to solve puzzles to save her. Each gamer can create and summon anything they can imagine, from characters like Mario, to a puppy to a rainbow to whatever else. Your creations then run about in your world. You can share creations with other players, as well, by putting them in a “hub” or shop. This is a one-player game. Scribblenauts Unmasked: A DC Comics Adventure lets your imagination run wild(er) by combining the Scribblenauts world with thousands of DC characters and objects. Available now on Nintendo Switch, PlayStation 4, Xbox One. Under $40. If you’ve got a child who’s obsessed with Yo-Kai, he or she’s definitely not alone. The latest Yo-Kai games, Yo-Kai Watch Blasters: Red Cat Corps and Yo-Kai Watch Blasters: White Dog Squad, let players team up with up to three other friends, either at home or online (parents, be on your toes as to whom your child “friends” online) to fight the “Big Bosses,” develop and use skills and special “Soultimate Moves,” and befriend more than 400 Yo-Kai on your journey. 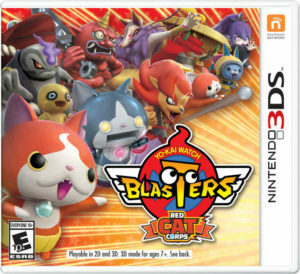 These games are different from previous Yo-Kai games in that instead of playing turn-based battles, the Yo-Kai Watch Blasters games have gamers play in fast-paced, real-time battles and missions with action-RPG throughout. During these battles, you directly control your Yo-Kai as you strategize with different skills and equipment to defeat bosses. Both of these games are available for the Nintendo 3DS family of systems for $39.99 each. 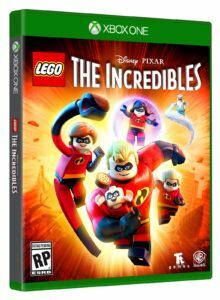 This entry was posted in Reviews and tagged dc universe, harry potter, incredibles, lego, yo-kai on December 7, 2018 by Parents@Play Team.